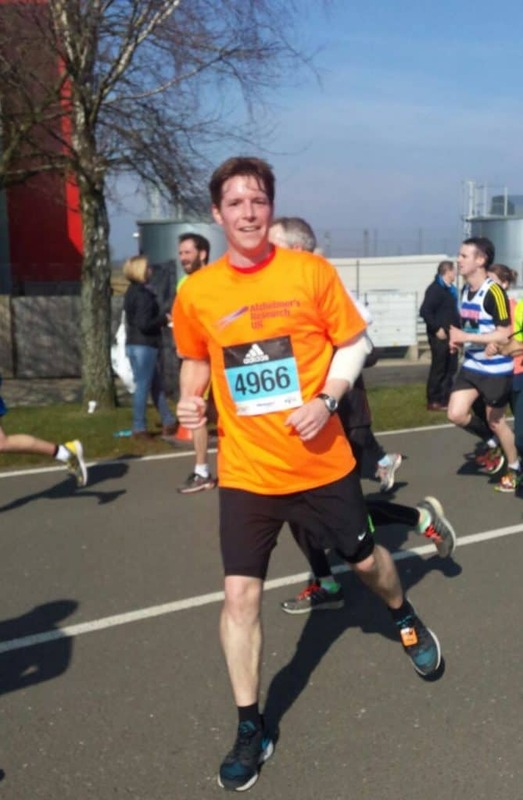 I have not run a half marathon for 5 or 6 years but I was excited about the challenge and though I only had 6 weeks to prepare I thought I could get some miles in my legs to get through it and hopefully post a good time. I did not get much chance to put in many long training runs; I tended to tag a run on to my current BMF training (run to and from BMF or do the Bushy Park parkrun after a 1 hour BMF session). My preparation the day before was heading to watch the England vs Wales Six Nations Rugby at Twickenham Ales Brewery. The stress of the game (25-21 to England, and a near last 20 minute collapse by England) and standing for most of the day was not the greatest prep, but I survived on a couple of cokes and some water as my friends tucked into some locally brewed ales. My girlfriend and I set off at about 9am from London to rural Northamptonshire for the very reasonable 12 noon start. There was a bit of traffic and the odd accident that held us up, but we made it in plenty of time. The car parking facilities at the race course are abundant. There is quite a walk from the car park to the start of about 25 minutes. The excellent pre-race information pack warns you about this. The weather was improving. The day had started out very foggy but by about 11am the sun was coming out and the fog had cleared. Fantastic race conditions! Cold, low wind and sunny! After the walk, a couple of toilet breaks, messing around with my kit, dropping my bag off, retrieving my bag to get my shot bloks and posing for a couple of photos, my warm up was to run to the start line and arrive with 2 minutes to spare and hear David Weir setting off in the wheelchair race. Excellent planning! The course is one lap of the F1 circuit, through the old pit lane and around a number of service/recovery roads before you re-join the F1 track again and do the lap in reverse and finish by passing through the start line from the other direction. I had never been to Silverstone before and it was fun to run on the circuit and see the width, the height of the kerbs, the undulations and the daunting length of the straight. I am sure they do not look so long when you are doing 200mph. 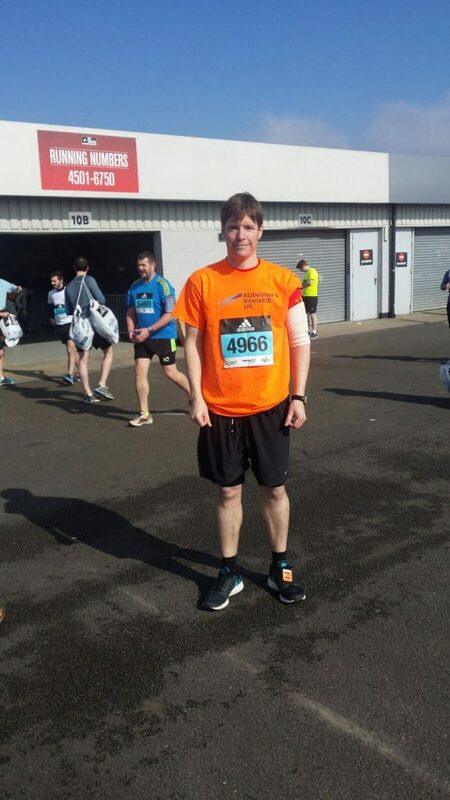 Adidas Silverstone Half Marathon 2016 on the way to a PB! The atmosphere was great and as I said the weather was excellent. I passed through 10km in good time; I was not too far off my 10km PB which was a surprise and I started to think I could have over cooked this. I realised I had over cooked this around Mile 8. I was still moving well, but my quads (my Achilles heel – if that makes sense) were starting to tighten up and I willed the mile markers to start appearing. I managed to see my girlfriend a few times during the race which kept my spirits up. 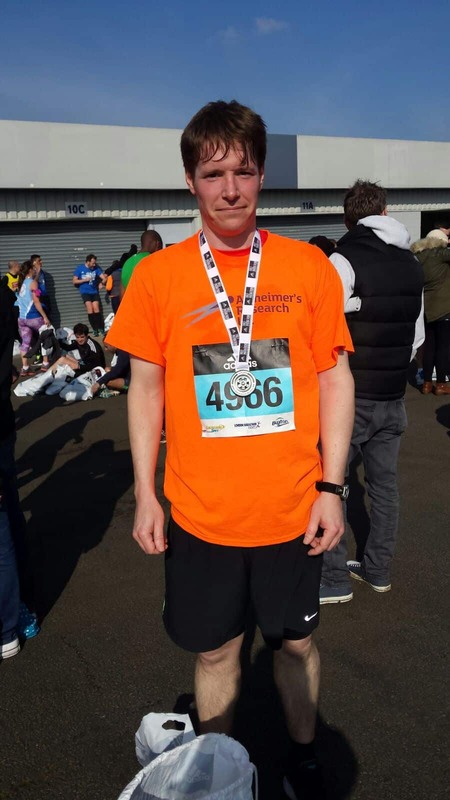 I pushed on through and the finishing kick that my Mum taught me as an 8 year old 800m runner was nowhere to be seen, but I could see the clock in front of me and it was going to be a PB. I was exhilarated that the race had finished, so much so that I forgot to stop my stopwatch. My finishing time was 1:47:15 which I was very happy about. My previous best was just under 2hrs that I had done 8 years ago. I waddled over see my girlfriend, got some pictures and then went to pick up my medal, t-shirt and goody bag. The walk back to the car help ease the stiffness in my legs and the kindly made packed lunch got devoured. A PB and a medal. Very happy! I definitely underestimated the distance and effort a half marathon requires. A couple of quick 10km races had fooled me into thinking I was in better shape and that I could cheat my way through on good base fitness. I achieved a huge PB, but I think I got away with this one. Much more dedication and training will need to go into the next half marathon (possibly The Great North Run). As you would expect from the people who organise the London Marathon, the whole event is very professional. The bag drop is very well manned and close to the start/finish line. There are lots of toilets. The course is interesting, there are a few dead areas where there are no spectators and you are running along a fairly non-descript service road, but you will find that at any race. It was not too crowded. There are a few hills, but nothing that is going to catch you out. There were plenty of spectators and the best thing is that it feels like a big race (around 7000 runners I believe). Probably the only down side would be getting to and from the circuit. There is no direct rail service to Silverstone so car or coach are the only options. There are return coach services from Central London (£25) and central Birmingham (£20). 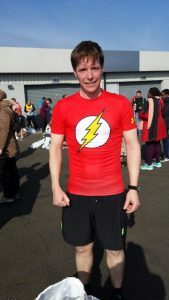 So, all in all, a very good, well organised race which is a good warm up to the London Marathon and comes highly recommended. 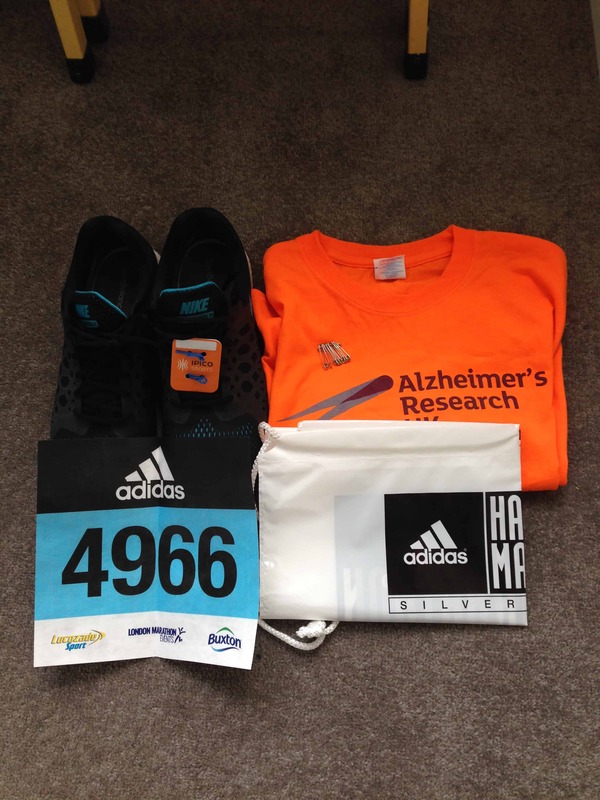 Thanks to Alzheimer’s Research UK for the free place (I donated my entry fee via my sponsorship page) and the kind people who sponsored me. Thanks Dorata! Really enjoying it and my writing is hopefully improving! Previous Previous post: A little more about me! Next Next post: How do i start?